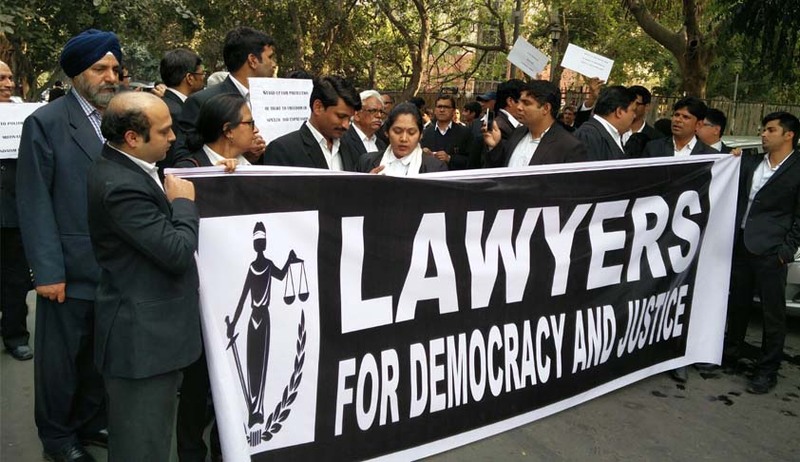 Dispelling the bad impression created against the lawyers in the wake of Patiala House incidents, today, a large number of lawyers took out a procession from Supreme Court of India to the office of the Bar Council of India(BCI) holding placards condemning ‘hooliganism in courts’. Lawyers practicing in various courts of Delhi marched peacefully under the banner ‘Lawyers for Democracy’ to the office of theBar Council of India and submitted a memorandum seekingimmediate disciplinary proceedings against those lawyers who engaged in violence in Patiala House Complex on 15th and 16th. Mr. Somdatta Sharma, The General Secretary of ‘All India Lawyers Union’ while addressing the gathering reminded the lawyers about the onset of infamous emergency and role of lawyers in protecting the ‘ Rule of Law’. The Secretary of PUCL Mr N.D. Pancholi recalled the trial of accused in Parliament Attack case. According to him, even the accused in Parliament attack case did not suffer any harassment while they were attending the trial. Mr Rajendra Pal Gautam, the Member of Delhi State legislative Assembly said that the undemocratic forces are trying to convert the country as Pakistan and the lawyer’s community which had a major role in the Freedom Struggle Movement should come forward against any such activity which is against Democratic values. The lawyers attended resolved to be united against any attempt to subvert the constitutionalism.